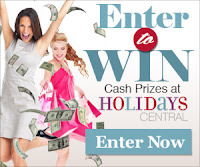 So I admit to being a little addicted to the TLC show "Extreme Couponing." In fact, after I write this blog post, I am going to watch yesterday's episode! One thing that fascinates me about the couponers' stockpiles is the amount of items that are stored in outside freezers. Many of the folks portrayed have several chest freezers full of bargain-priced meats, vegetables, instant dinners, and the like. I have considered getting a standalone freezer, but haven't yet. First of all, I have nowhere inside my house to put it. There is no room in the kitchen, and my laundry room is postage-stamp-sized. I don't have a basement here in South Florida. And to me, the garage is not an option because of the high temperatures during the summer. In addition, I am concerned about the electricity costs of having a second freezer. I'm sure many of you who have a good, cool place to store your freezer end up saving more by combining sales with coupons and by buying in bulk than you spend on extra energy. But for my family, I don't think it's worth it. We don't eat that many frozen foods. We just don't really like most frozen vegetables. Now that I have found a low-cost produce store, I am even less likely to purchase frozen veggies. I mainly purchase and freeze food items that are ingredients for meals - mainly meats, butter and cheese, and a few veggies and fruits. I also get juice concentrates. I generally don't buy items like frozen meals or treats (though there is some ice cream in the freezer picture above that was purchased for a birthday party). When there is a good deal on frozen food that we eat, I will check the freezer to see how much room I have to store it and buy accordingly. The sales will come back again! Organization! With such a small space, I have to be sure that I am using every inch of space to its fullest. Meal planning! 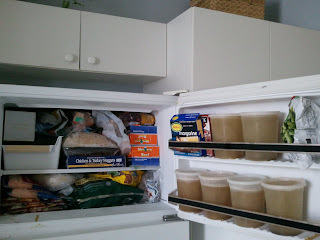 I plan my meals each week and try to use up foods that we have stored in the freezer. Cooking for the freezer - I don't go overboard with this. 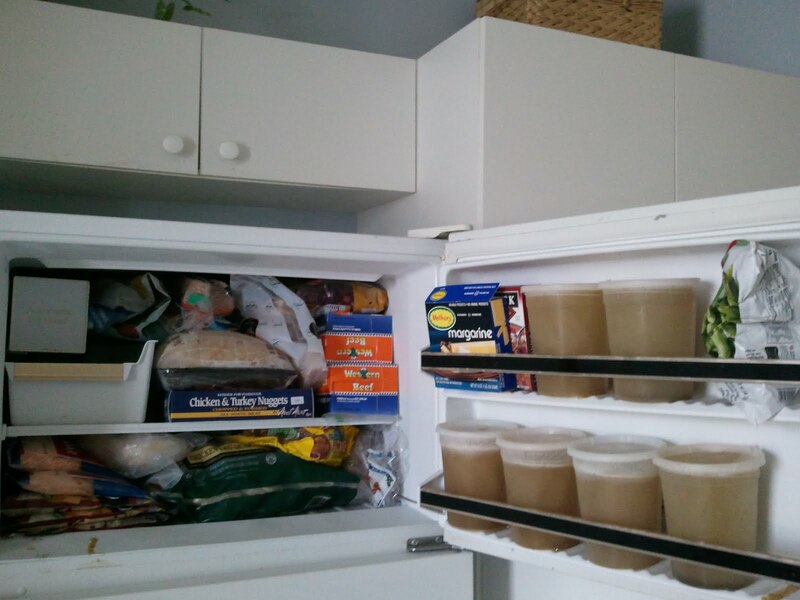 I will make broth that I store in quart-sized containers in the freezer door. Casserole-type dishes are frozen in gallon-sized plastic bags laid flat, then stacked upright like books on a bookshelf once fully frozen, to save space. When you do cook for the freezer, use ingredients that you were storing in the freezer, so there will be room to store the cooked items. Hope this helps you stockpile your freezer the not-so-extreme way! Please share any tips you have to use your small freezer space! Next week, my health and beauty aids stockpile! I live in Central Florida and have a freezer in my garage. I have to defrost it twice a year because of the moisture here though (and my teens keeping the door open too long). My parents bought it for me as a housewarming gift. I love, love, love my small chest freezer. I would definitely recommend it. I don't think an efficient freezer should be affected by outside temperatures. Just don't make the mistake I did once (with an old regular fridge/freezer, before we got the little chest freezer)--forgetting to close the door in 95 degree weather! Yeah, that was a disaster. Great tips on using a small freezer! We're a family of 7 with a huge vegetable garden. We had one 20+ cubic foot freezer for the longest time and just added another one last year. We have the second off right now waiting for the harvest to start. Since we go through 5 gallons of milk each week, I also like to keep my milk in the freezer to free up fridge space. I bought my own freezer at Jewel for $179.00 and they gave me a coupon for almost $150.00 worth of food to help fill it up. I also freeze milk and butter. and buy all my meat once a month in the large family packages and divide it up. It saves alot of time and money as long as I remember to take it out soon enough for it to thaw. Last month my food bill for asingle male was only $103.44!! !